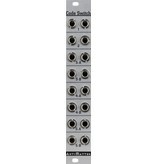 This expander provides 8 handy in/out switches/mults in 4hp that are controlled by the outputs of the 5 Launch Codes channels. When each switch is not in use, its output provides a mult out of the designated Launch Codes channel. Use this expander with the Launch Codes channels in gate mode to gate audio, trigger/gate, or logic streams. It is especially fun to sequence clock or chaotic trigger streams and saves many external modules that would be needed to do so! Experiment with external clock dividers or other sources to use as a sequenced AND logic with the Launch Codes channels.